Ashley Jackson (red, left) scored for Netherton at ICA Sports. Netherton United boss Jon Harrison believes his side proved their Peterborough Premier Division title credentials with a battling 3-1 win at in-form city rivals ICA Sports last weekend. ICA became the only team to beat leaders Moulton Harrox in their last home game and they pushed Netherton all the way before a brilliant goal from hot striker Ondre Odain, his second of the game, secured victory. Ash Jackson also scored for Netherton. ICA replied through Nathan Glover and the same player struck the bar when it was 2-1. The top three have cup ties tomorrow (November 25). Netherton and Sports Reserves are in Northants Cup action at home to United Counties League sides Wellingborough Whitworth and Thrapston Town respectively, while Harrox host Sutton Bridge United in a PFA Senior Cup tie. The Premier Division’s bottom two Deeping Rangers Reserves and Langtoft United also clash in the Senior Cup, while ICA are at Hemingfords United in the Hunts Intermediate Cup. Glinton & Northborough have pulled their first team out of the Peterborough League. 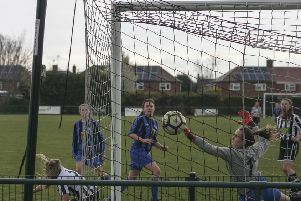 They were bottom of Division One and manager Chris Bennett quit after last Saturday’s 3-0 defeat at Wittering Harriers. A shortage of players caused the departure, but the club’s reserve team will continue in Division Five. The Division Four game between Huntingdon Rovers and FC Peterborough Reserves last weekend (November 18) was abandoned after 71 minutes following reports of ‘a mass on-field confrontation’. FC Peterborough were leading 3-1 at the time. Premier Division: Leverington Sports v Thorney, Warboys Town v Holbeach United Res, Whittlesey Athletic v Ketton. Deeping Rangers Res v Langtoft Utd, Moulton Harrox v Sutton Bridge United. Hemingfords United v ICA Sports, Huntingdon United Res v Ramsey Town. Netherton United v Wellingborough Whitworth Res, Peterborough Sports Res v Thrapston Town.